The weather was hot with temperatures reaching into the 90’s after a cool 60 deg at the 5:00 AM start. Clouds gathered in the late afternoon & a few thundershowers cooled off the temperatures later in the day. 105 of the 125 registered runners started with 83 finishers. I finished in 68th OA & was 1st in the 65-69 div. & also the oldest runner entered in the race. 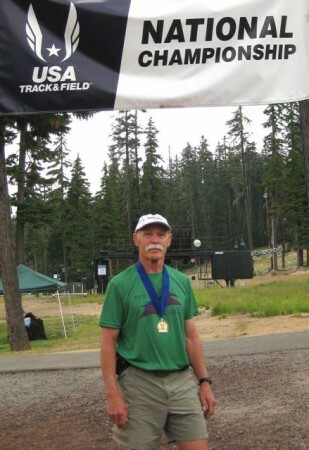 This was my 155th ultramarathon and my 2nd time running this race partly in preparation for running it again next year when I turn 70 and it will once again be the USATF 100K Trail Championships. My goal of becoming familiar with the course has now been accomplished with 2 consecutive finishes & several training runs on the course. Most runners planned one of two strategies for approaching this race. Some would attack early for time when the conditions were more favorable & others would go out more conservatively to save resources for the last 2 hard climbs in the inevitable heat that would be coming later in the day. Finally for this race I felt that I was adequately prepared after several injury setbacks during the past few years. I decided to run conservatively staying within my comfort zone until I reached the Charlton Lake aid station at 32 miles. My main goals were finishing within 16 hours time limit to earn the WW cap & to possibly place well in my USATF age group div. I was determined to keep myself properly hydrated, avoid falling & injuries, keeping my energy levels right, let the competition take care of itself and having piles of fun. Right from the start I walked the first 1600′ climb of about 2 miles in the dark. It became light enough in the dense forest to turn off my flashlight about halfway to the 1st aid station. The running became delightful when we got on the Pacific Crest Trail for a few early miles. The descent was that kind of downhill running I relish, where gravity does most of the work & one simply provides the leg speed. Much of the downhill on this course is like that, but not all of it! The 2nd big climb from Gold Lake aid station at 4900′ goes to the top of Mt Fuji, 7144′ in 5 miles. Here is where I saw Waldo Lake, the race’s namesake, for the first time. I felt good both running & walking up & was then able to run very comfortably down to the Mt. Ray aid station at around 5000′ at 20.5 mi. This is the section where I tumbled last year straining a groin muscle which hampered my run all the way to the finish. When I passed the spot I had fallen I sent up a silent thanks for my good fortune thus far this year! The next climb is a long & mostly runnable section up to about 6600′ over the shoulder of the Twins & then down to the Charlton Lake aid station at 32 miles & 5600′, almost all being on the PCT. I arrived in 7:40. This was a bit slower than I had originally hoped for but as the day was getting hotter I was pleased with my progress. I had determined to keep my effort lower considering the conditions for I was well ahead of the cut-off times & the last 2 big climbs would be much more difficult, especially in the 90+ deg heat. These next 10 or 11 miles were delightful trails affording good running but I still reigned in my pace to save some energy for later. The climb up the Twins, 6450′ went well for me & I reached the Maiden Peak aid station at 49.9 miles, about 5700′ in 12:30. I had originally expected to be there in 12 hours but was satisfied with my time and to still be feeling as good as I did anticipating the huge climb ahead. A few clouds had now gathered & helped to check the temperature. Leaving the aid station, the climbing intensifies immediately. Now it even started getting a little cooler as I gained altitude.. A few rain showers & some light hail also started up which felt very refreshing. There’s precious little running up the Maiden Peak Trail for us mortal runners so I continued on as best as I could, running only when my now diminishing energy resources & the trail allowed. No one passed me on the approx. 2 mile climb & to my surprise even a few runners were coming back down to drop out of the race at the aid station. To my further surprise I was able to finally overtake my age group competitors near the top. There’s a 1/4 mile out & back spur trail to the summit at 7818′ elev. Here we were able to see one another passing by. From the peak the course immediately plummets 1000′ in the first mile on its way down to the last aid station at Maiden Lake, 6342′ and 7.5 miles from the finish. From there, It’s almost all downhill the rest of the way with the last few miles once again on the PCT. I had 1:45 left for those 7.5 miles as darkness fell to make the magic 16 hour Waldo Cap cutoff. I knew I was in first place in my age div. and I didn’t want them to catch me so I ran like my pants were on fire when It wasn’t too steep. My old legs responded as best they could & I finally burst out of the forested darkness into the dazzling finishing arena to a rousing celebration that inspired my improvised sprint to the line in 15:59:17. I get to wear a WW cap with 43 seconds to spare! Craig Thornley & Curt Ringstad have really excelled directing this event into one of the finest ultramarathons I’ve run in the 30 years I’ve been at this sport. They’ve gathered together a competent staff of about 150 eager volunteers & generous sponsors at a venue that deserves to be a destination race for every ultrarunner out there. I fully appreciate all they do & will most certainly be back next year to run Where’s Waldo 100K as a celebration of my 1st race in my future 70+ age div.